When brands can’t afford the price of an A-list celebrity for a single Instagram post, there are still ways to tap into the power of influencer marketing without putting ROI in jeopardy. Working with micro-influencers can be an effective alternative that can generate great results for brands. Micro-influencers are a hot commodity. They have a limited following, usually up to 5,000 but offer higher levels of engagement with their followers than power influencers, and are considerably less expensive. They are highly trusted and rarely approached by brands. When they do post sponsored content, their followers believe their motivations are genuine are the response is usually very positive. This means they are best placed to drive sales and work particularly well for industries where trust is critical. Working with a micro-influencer who is already a fan of a brand, who uses the product or service or already post about the company is a great place to start. It means there is a natural fit between the brand and the influencer and the collaboration or content will appear more genuine to the followers. Whilst working on the Vans Ultrarange campaign, it became obvious after doing some research that there were some genuine brand lovers in Dubai. @arineisk, for example, lives and breathes the brand. Her social feed is already packed with skating moments, and her entire wardrobe is Vans branded. Offering her to work in collaboration with her favourite brand was an obvious choice. It was an opportunity for her to get a step closer to her favourite brand and gain access to products before everyone else. Micro-influencers like her are not only authentic, they are more cost-effective and often go above and beyond to deliver higher quality content and engagement because they are genuinely passionate about the brand. They are not looking for huge payouts and are often happy with a small cheque and branded gear. As we mentioned in our Influencer Marketing Manifesto, working with micro-influencers should not be transactional; thinking about the relationship long-term is essential. After all, micro-influencers are an extension of the brand and investing time into building a relationship that will be mutually beneficial will pay off in the long run. The whole experience from the first email to the shoot or event day should be genuine and relay a phenomenal brand experience. 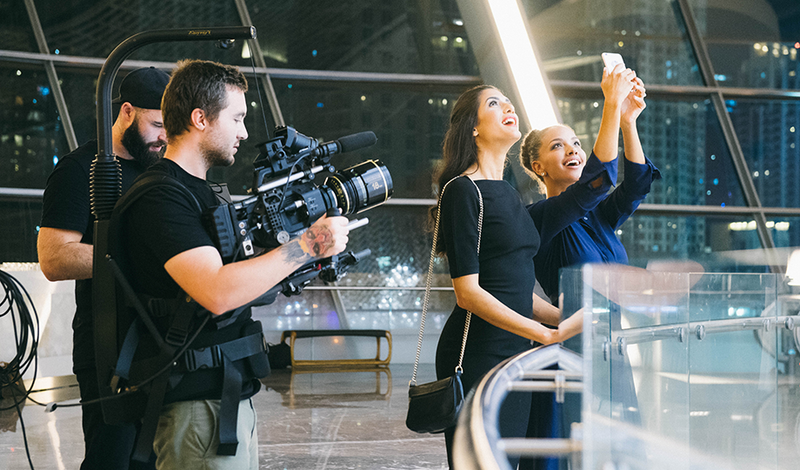 Behind the scenes at our photo shoot for Emaar's Ultimate Influencer Campaign. The brand or agency should use all touchpoints to make sure the micro-influencers love the brand even more. Building a personal relationship with them, giving them time and offering them exclusive content or merchandise will help forge a trust and a sentiment of belonging. Hosting a brand immersion day with all the influencers involved in a campaign to encourage a sense of community can be so powerful - and translates really well on social media. Think about what outcome you want from the very start and have a clear plan. Too often, brands spend considerable amount of time and money finding the right micro-influencers and producing pieces of content but don’t have a seeding schedule and a media plan. Where will this content be featured? Will it be evergreen content or sponsored? How will the influencers promote it? Will you promote or sponsor the content on your owned channel and/or through paid channels? For our Timberland City Sniper campaign, we collaborated with 10 micro-influencers and created a bank of 100 powerful images. We created a social gallery on Instagram and used some of the top photos in store, on billboards and on the client’s key channels (blog, social pages, etc.). All influencers were provided with a clear seeding schedule ensuring the campaign went out with a bang. It's crucial to understand your internal inventory to extend the life of the content produced. Make the most of your content and think of ways it can be used post-campaign (stakeholder or employee engagement, in store, etc.) to maximise ROI. Although micro-influencers are powerful and can often be easier to work with, there is still a place for niche & power influencers. Thinking about a multi-layered approach for a campaign is often the key to success for the perfect combination of reach and engagement. For more information on the power of influence, download our Influencer Marketing Manifesto.